Director Shimomura Yûji takes his experience as a stunt coordinator and churns out an intense, bone-crunching martial arts extravaganza with Re: Born. Starring Sakaguchi Tak the film follows a former special forces operative Toshiro (Tak) who, thanks to a special fighting ability gained through mysterious circumstances made him one of the most lethal soldiers on the battlefield. Now Toshiro just wants to lead a quiet life alone with his young daughter Sachi (Kondo Yura), but when his old commanding officer code-named “Phantom” (Ôtsuka Akio) shows up seeking revenge for something from their pasts, Toshiro is forced to fight against a group of highly skilled assassins. And his mission intensifies when one of them kidnaps his beloved Sachi. Re: Born doesn’t always look like a great film – its low budget shows, especially in the opening sequence that looks quite cheap, but it picks up further into the film with a better look and the fight choreography, which the director refers to as “Zero Range Combat”, more than makes up for some of these deficiencies. Tak is also seething in this role. 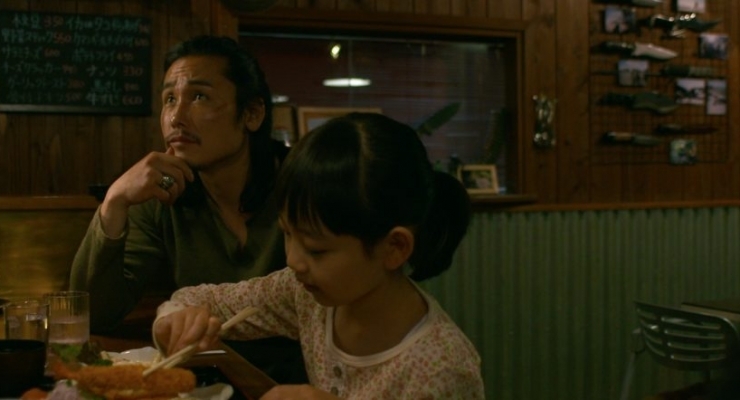 He’s intense and convincing in every way, while all of this violence and testosterone is balanced out by the immeasurably cute young Kondo Yura who perfectly smooths out the rough edges of Tak’s tough man character Toshiro. Given the over-the-top archetypes and progression of battles that take place in Re: Born, it’s hard to believe that the film doesn’t have its direct roots in a manga, but even if it doesn’t, it is most definitely influenced by the manga and anime-isms and may easily be adapted to the format. In the meantime, martial arts fans will enjoy this fine piece of gritty, highly choreographed escapist drama. Re: Born comes to Blu-ray from Eureka Entertainment from what definitely looks to be an original digital production, but not a very high end one. I’d speculate – not having been able to hunt down the technical specs on this – that it was shot on an Arri Alexa at 2.8K. It comes to this disc in a competent AVC 1080p transfer, but the original image is hardly reference quality. The contrast is middling at best, with blacks looking more greyish and brights looking the best, but some clipping, such as a lantern in a dark room that is has white levels pushed a bit too much. Speaking of which, when this film does get shadowy, it tends to look noisy and murky, and nuance disappears. The original Japanese soundtrack is offered in DTS-HD Master Audio 5.1 as well LPCM 2.0 stereo. The 5.1 mix is good, but it could be better. There are moments when discrete effects are spread wide through the surrounds and front left and right channels, but these tend to seem a little out of place and, using a highly technical term, “wonky” since the mix goes for long periods where it is really front-heavy with low-level atmospherics in the surrounds. Apart from that the dialogue is clean and there is good, but not staggering, low-end. There isn’t much included in this basically barebones release from Eureka. A very brief filmmaker “introduction” of what amounts to an under 40-second video clip of the director Shimomura Yûji and star Sakaguchi Tak introducing the film at a Japanese premiere in a very lighthearted and physical way, and two trailers are all we get in addition to the standard DVD, which also contains the feature. Here’s hoping this film, with its sort of cliffhanger ending, gets a sequel, because it was a fun ride that goes by more quickly than its 100-minutes running time. Eureka’s release is a little barebones, but still worth it. Former special forces operative Toshiro (Tak) who has unique and deadly fighting abilities linked to something from his past want to live a quit life alone with his young daughter Sachi (Kondo Yura), but when his former commander (Ôtsuka Akio), code named 'Phantom', reapers in Toshiro's life seeking revenge and has Sachi kidnapped, Toshiro goes on a bloody rampage against a group of highly skilled assassins to get hr back and to take down Phantom. Re: Born may at times show the signs of its small budget, but director Shimomura Yûji, who comes from he world of stunt coordination, uses his and Tak's abilities superbly crafting what he calls his "Zero Range Combat" for an solid martial thriller.